This was my first ever attempt at fudge, something I thought was really difficult and needed lots of thermometer type things. I was so wrong. I want to make something scrummy, something the kids could help with, and most importantly, would keep for a while to give out as teacher presents for all at school and nursery as I know they can be inundated with edibles at this time of year and biscuits have a very short life span. 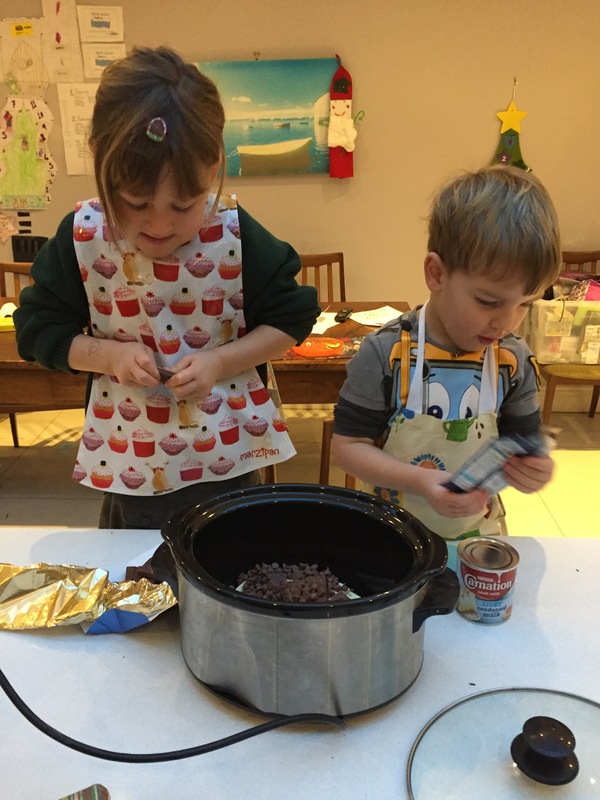 I was toying with the idea of making chocolates when a tweet popped up in my feed from You Baby Me Mummy with a post she’d written about slow cooker fudge. You can read the post here. I decided to give it a go. I promptly went out and bought the ingredients, although I didn’t actually read the recipe properly and had to use a mis-mash of chocolate bars and some chocolate chips I found in the cupboard! It was a mix of white and milk chocolate I used, you really do need a lot of it!! Break up the chocolate and add to the condensed milk in the slow cooker. Turn to high and stir well, leaving uncovered. 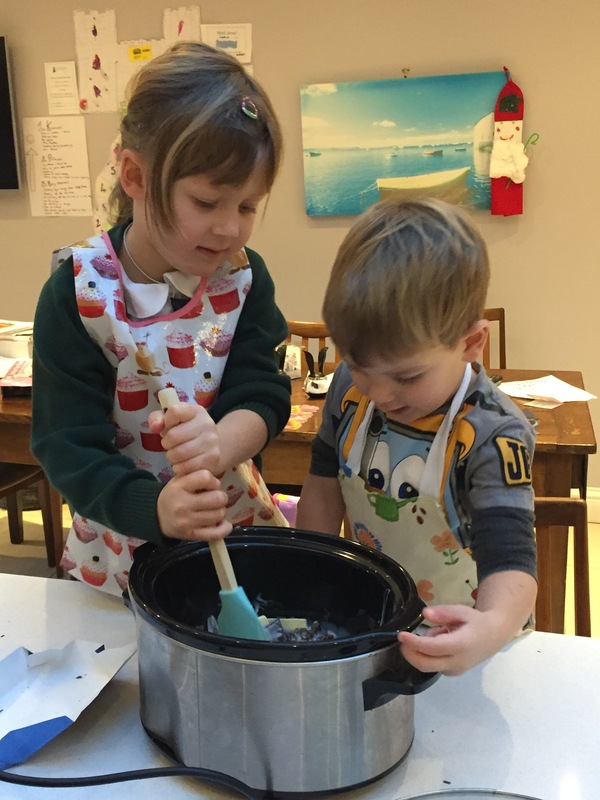 Little helpers can really get stuck in! Stir every 10 minutes, (or more if you really can’t leave it alone! ), for about 45 minutes to an hour. We used a silicone spatula, be sure to scrape round the edges yourself often to make sure you don’t get any burnt bits as enthusiasm doesn’t always mean accuracy of stirs! They were actually really good at taking turns! Once all the chocolate has melted, turn to low and cook for a further hour, still uncovered. We stirred it several times in this period. Line a cake tin or similar, with greaseproof paper and pour the mixture out. 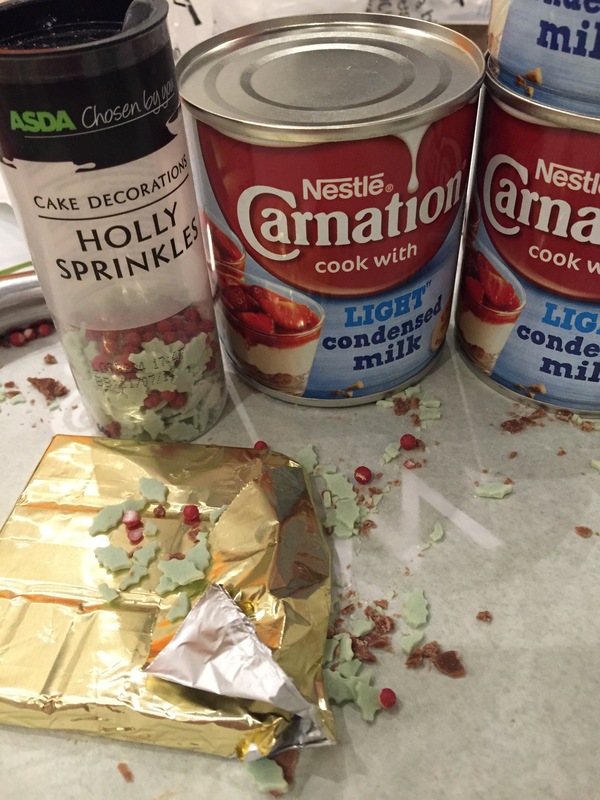 At this point, I sprinkled over the holly decorations I’d found and lightly pressed them into the surface with the back of a spoon while it was still soft. The very few ingredients needed. I also got some other toppings to make some more. All the ingredients you need for slow cooker fudge. Ooo! Looks lovely 🙂 And so nice to see it’s a child-friendly activity too. Drat our useless Asda. 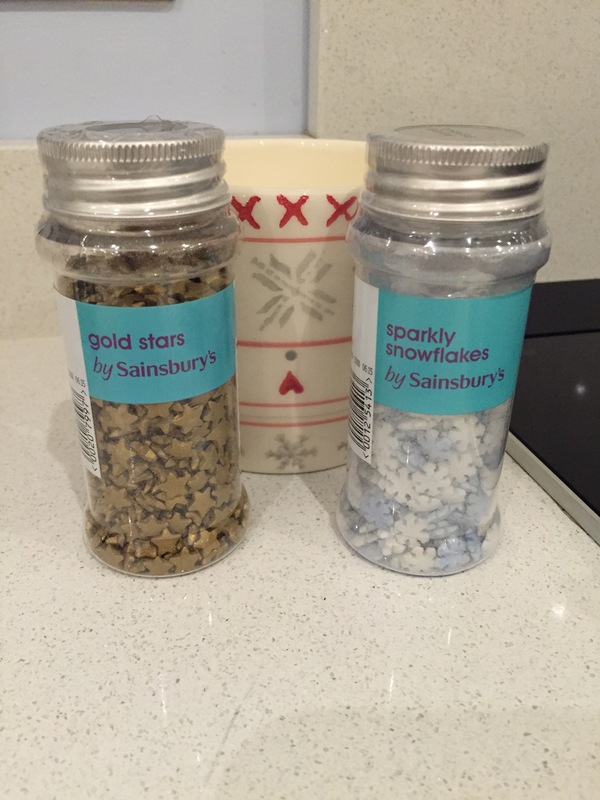 I went in last week looking for festive cake/biscuit decorations and did they have those lovely holly ones? They bloody well didn’t 🙁 Oh well, next year! Oooohhh, looks yummilious and looks easy to do with a young kid. I think I’ll give this a go with Kiddo this weekend. He’ll love helping and we all love fudge. Wow, I had no idea it was that easy to make! I will definitely be making some, I’m not sure how much I’ll share though, haha! Oh these look so yummy! I don’t have a slow cooker (I think I must be the only mum without one) but if I did have one this would probably be my most made recipe. We all love fudge in our house. WITHOUT A DOUBT I am making this! Love my slow cooker. Love fudge. Winner! Guess what all of the teachers are getting for CHRISTMAS!!! You are such a Pinterest mum! 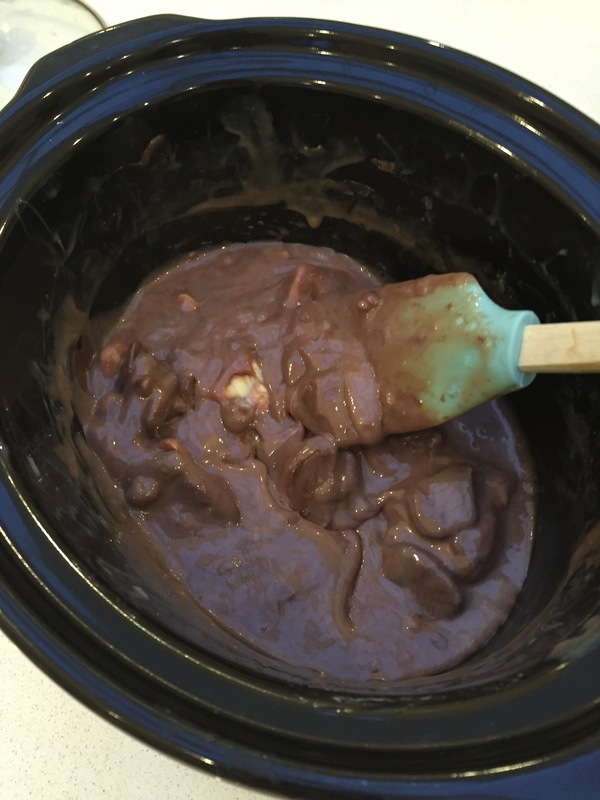 I had no idea you could make fudge in the slow cooker. Once I’m moved I’m getting mine out and doing this! That looks so easy! Almost too easy… The catch of course would be that I’m going to end up eating half of this and ruin my diet, right? I bet this makes the whole house smell so good! 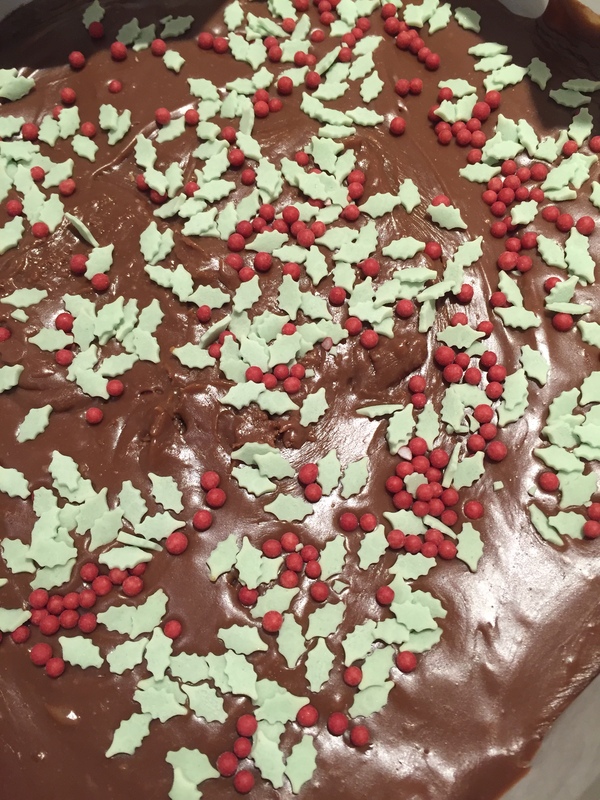 We made mint aero slow cooker fudge last year – it was so, so good, but it made such a tiny amount it was gone within minutes when our friends came round! Looks completely yum! Thanks for sharing. This looks delicious! I have written the recipe down and I am stealing it! Yum! It looks yummy! Unfortunately, I don’t have a slow cooker but I do make fudge using a recipe my mum has every Christmas. Fudge is very Christmassy to me. 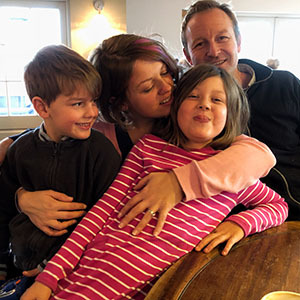 I always love the idea of home made gifts, too; so personal and much better for the environment than buying loads of stuff (although, I’m just as guilty as the next person of buying a load of Christmas tat!). I love fudge so I am a little bit scared of making this in case I manage to make a really good batch and then I have to eat it all and then I will feel very sick ha ha! 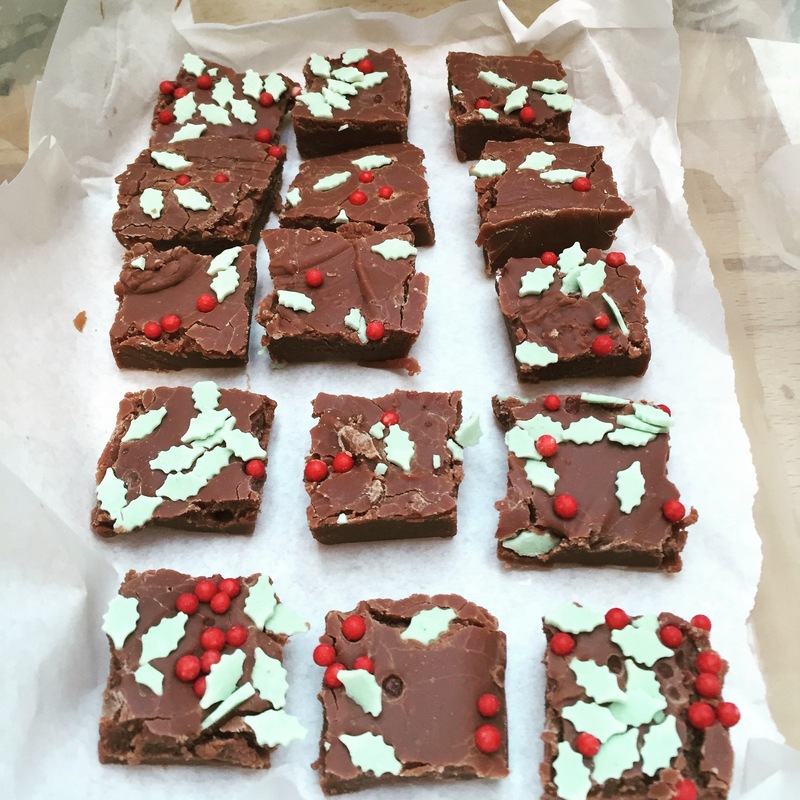 I did try an ‘easy’ fudge recipe a couple of Christmases ago and it didn’t turn out at all. I do have an abandoned slow cooker so perhaps this is something for me and Siena to try! 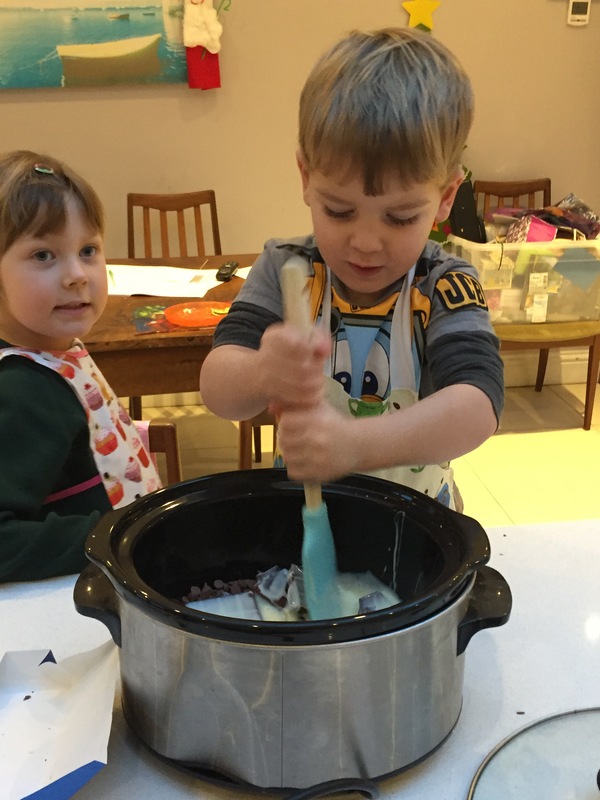 My wife and I are big slow cooker fans, we have 2 young children we find it makes our lives so much easier. 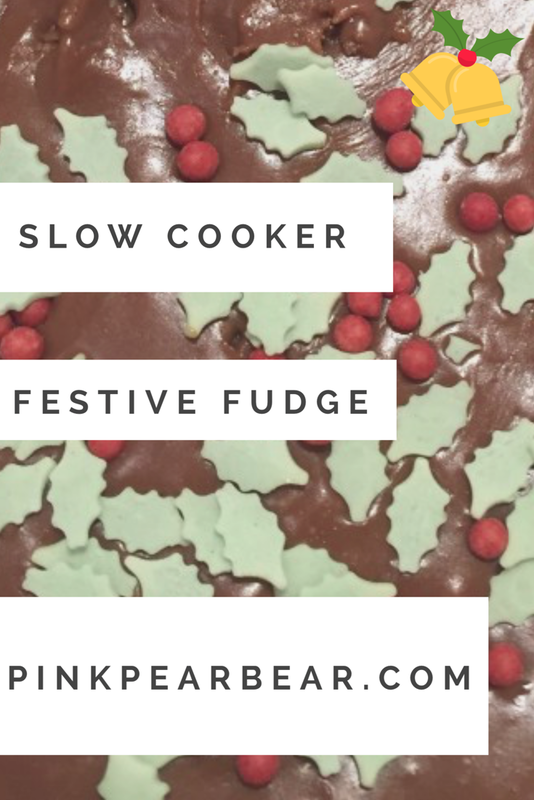 On that note, we have just posted up our slow cooker own fudge recipe, It’s very similar to yours (with more chocolate :D) but we would love you to try it out and see what you think.